Want to join our adventure-loving staff? We'd love to have you! Know a lot about Pittsburgh's history and architecture and enjoy showing off this town by bike? Have experience biking around the city streets? Love meeting people and having fun with them? Sounds like you might be a great fit as a bike tour guide for Bike the Burgh Tours. Download the job description and contact information by clicking on the pdf below. Hello! I am Val (short for Valentina), the founder, owner and tour guide of Bike the Burgh Tours. Originally from the Italian Alps, I lived in Germany for over 10 years. I studied in Munich (Germany) and Rome (Italy) to get my Master's degree in art and architectural history. After that I also spent some time in NYC where I met my future husband, a real Pittsburgher. After years of a long-distance relationship, we finally decided to declare Pittsburgh as our new home. I was so surprised of the rich history and culture the city has to offer that I decided to study and share it with people in a different and sustainable way: on bikes! The idea for Bike the Burgh Tours was born while exploring European cities by bike on vacation. With the increasing numbers of bikes and bike infrastructure on Pittsburgh's streets, Bike the Burgh Tours wants to close a gap in Pittsburgh tourism. All major cities in Europe and US cities like Portland, San Francisco, Washington and New York City have guided city bike tours already, and now it's Pittsburgh's time. 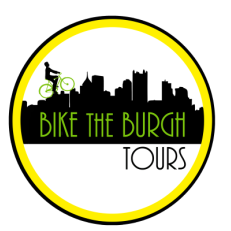 The mission of Bike the Burgh Tours is both to reveal the actual beauty of Pittsburgh and to promote biking as a healthy, green and sustainable method of recreation and transportation. Dave moved to Pittsburgh in 1995 from ​Williamsburg, Virginia after growing up in ​another steel town: Gary, Indiana. He's been biking around Pennsylvania's Steel City ever since. He loves ​cycling​, and you might see Dave​ climb​ing​ hills early in the morning on his vintage Motobecane​, or working at Bike PGH -- in fact, he's a Bicycle Educator in the League of American Cyclists​. ​But the exercise doesn't wear him out -- as a former track and field coach ​at Pitt​, ​former competitive masters runner, and former bike racing dabbler, ​he's got the endurance and speed to tackle any road ​the Burgh has to offer! ​Curious by nature, ​he loves to learn and is a big reade​r. If you ever wanted to know about beavers in our rivers​ and ​local wild turkey populations​, for example, Dave's the guy to talk to! He holds a Masters in Science teaching, and his varied science background carries a particular focus on birds. We love having Dave on the team -- he's a fun person to be around, very relatable and knowledgeable. He will be showing you around a lot this summer​, s​o ask him every question yo​u have: ​he's got this town​ down​! Paul grew up in one of our neighboring cities: Erie, PA. He studied architecture at the University of Detroit-Mercy. He was the University Architect at Carnegie Mellon for nineteen years, where he started guiding tours of the CMU campus. His interest in Pittsburgh history and architecture only grew from there. Now, Paul shows visitors around Pittsburgh by boat, bus, bicycle, and on foot. He loves that Pittsburgh is becoming more bike-friendly, and enjoys riding both the city streets and trails equally. One of his favorite parts of Pittsburgh's landscape is how the history of 20th century architecture is present and visible in the city's downtown Golden Triangle. Join one of Paul's tours and profit from his tremendous knowledge and contagious enthusiasm! Anna is Bike the Burgh's market research and social media coordinator. ​She's a ​native of Cooperstown, New York (home of the Baseball Hall of Fame) and has lived in Belgium, France, and Burlington, VT. Her first bike was a white Giant hybrid she named Bertha and rode to and from classes at the University of Vermont, where she majored in English and French. ​That was when she became better acquainted with urban cycling and public transportation advocacy​, interests and causes now very dear to her. In addition to developing Bike the Burgh's online presence, Anna is a current graduate student at Pitt, participating in the English Department's Masters in Fine Arts. Her concentration is nonfiction writing, and she is currently working on a project about her grandfather's experiences as a POW in WWII. ​She's a huge Penguins fan, which was a major draw in applying to Pitt, and has rapidly fallen in love with a city she always admired from afar. You can catch her around Pittsburgh's coffeeshops and parks, especially on the weekends. Christina grew up in the Pittsburgh area but yearned to see more of the world. She attended university in Spain and then lived in a variety of locations (Spain, Los Angeles, North Carolina) before recently settling back down in the Burgh with her wife. After way too many years at a desk job (creating Spanish subtitles), she decided she wanted to continue the exploration that she started when she was younger, so she became a certified Tour Director. When she's not off seeing and showing people the world, she can be found right here showing people around one of her favorite places - Pittsburgh! Christina takes turns manning (womaning?) the shop and will also be helping to launch our new Bikes and Brews Tour since she is a true beer aficionado. On her off days, you may run into her at any fun local event, unless she's relaxing at home with a crochet hook, a coffee, and her wife. Hoooray! We are now #3 of 33 Outdoor Activities in Pittsburgh on TripAdvisor! "Val did an amazing job of showing us the city and answering all of our questions. I can't say enough good things about my experience with Bike the Burgh Tours, and I can't wait to go back to Pittsburgh to ride with them again." "Wonderful way to explore the city and learn a lot about its history and culture. Dave was an excellent tour guide, with great knowledge of the city's secrets and showing us around. We visited places that we would definitely wouldn't go, with another type of tour. Thank you!!!" Did you take a tour with us recently? Leave us a review on Google, Yelp, TripAdvisor, or Facebook! Viaggi Vacanze, "Pittsburgh, una città nel futuro", Carlo Ferrari, March 2019. Columbus Monthly, "Best Driving Vacations: Adventures in Pittsburgh," Jillian Span Hofbauer, March 12 2019; "Bike the Burgh’s 'Beauty of the Burgh' tour provides a well-rounded look at points of interest[.]" Trekking.it, "All’inizio dell’America: Philadelphia e dintorni! ", Carlo Ferrari, February 2019. Pittsburgh Post-Gazette, "Food, fun and Segways: Pittsburgh tours for every taste", Regan Schell, July 27th 2018; "Perfect for the cycling enthusiast, or anyone, since riders of all skill levels and ages are encouraged to participate." The Incline, "Who’s Next: Tourism; Meet 16 people who are showing off the Pittsburgh region," MJ Slaby, May 8th 2018; "Passionate about daily walking and urban biking, Scholar told The Incline that the bike tours closed a gap in Pittsburgh tourism and promote healthy, green and sustainable recreation and transportation.​"
Best Things Pennsylvania, "The 10 Best Guided Tours in Pennsylvania!" Hilary Gunn; "Whether you want to bike to the ballpark and take in a game, or discover the beauty of Pittsburgh’s bridges, Bike the Burgh is a phenomenal experience." Hero & Leander, "Top 8 Alternative Things To Do In Pittsburgh", April 22nd, 2018; "For first time visitors to Pittsburgh we could not recommend the ‘Bike The Burgh Tours’ highly enough." Kidsburgh, "7 ways Pittsburgh kids can tour around town like a tourist," Michael Machosky, October 30th, 2017; "Bike the Burgh takes advantage of all those new bike paths and routes with tours that engage rides through most of the major inner-city neighborhoods: Downtown, the Strip District, North Side, South Side, Oakland, Shadyside, Friendship, and East Liberty." NEXTPittsburgh, Gina Mazza, February 14th, 2017: "Our motto is, ‘There’s no bad weather, only bad gear." Pittsburgh Magazine, Alexa Mavrogianis, August 2016: "Scholar is motivated by Pittsburgh's impact on American history, but she also admires the city's recent direction." Pittsburgh Post-Gazette, Bob Batz, May 25th, 2016: "We speak Swiss-German together!" Pittsburgh Post-Gazette, Larry Walsh, September 19th, 2015: "I was most impressed with how much Val knows about the city. I learned so much about architecture and history of Pittsburgh." BOLD Magazine, Amanda Cooney, Issue 13, July 2015: "Bike the Burgh Tours help you to stop and take in the beauty of our city and provide you some insight into the reasoning behind how and why things are the way they are." NEXTPittsburgh, Leah Lizarondo, June 6th, 2015: "The group setting gives everyone a feeling of safety and camaraderie, says Scholar. “There are a lot of people who come inexperienced at biking and are a little bit scared. But at the end of the tour, they have new confidence and sign up for more." Pittsburgh Post-Gazette, Jon Schmitz, May 26th, 2015: “I was surprised how awesome this city is, regarding its history but also its present ongoing transformation." Check out our friends at BikePGH, Pittsburgh's great bike advocacy. They really do an awesome job. Thanks to their hard work Pittsburgh streets became so much safer and more bikeable over the past years. Any information related to biking can be found on their website. One good example is the fantastic, interactive Bike Map they developed. Please become their member to support an increasingly bike-friendly Pittsburgh!